Standard - $39.99 Only 3 left! AHHHH! The zombie apocalypse is actually happening! Quick, grab your doomsday supplies, and meet us at the truck we've outfitted with spikes and armor, and we'll make a break for it! If we can get out of the city by nightfall, we might just survive another day, and we can look forward to a life of scavenging and being on constant lookout for hordes of walking cadavers with a ravenous case of the munchies. Actually, that sounds like a lot of work, so just put on this seriously scary Zombie Biter Mask, and then the shambling undead won't bother you! If the end of the world turns out to be a false alarm, this gruesomely detailed latex mask can also make your zombie costume look truly terrifying! 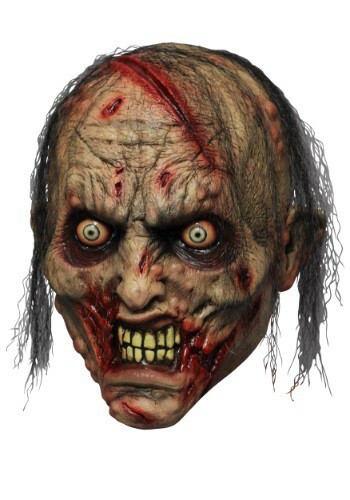 Simply wear this mask with any style outfit, liberally apply fake blood and gore to your clothes, and you'll look like you just stumbled in from an apocalyptic wasteland, in search of fresh meat!